Retail-focused Retrocom Real Estate Investment Trust (RMM.UN-T) has tripled its market cap within the past five years and its asset base has quadrupled to $1.2 billion during that same period, growing from 23 shopping centres to 59 and increasing its square footage to approximately 7.5 million. “We’ve taken the company to a new level in terms of size,” said chief executive officer Richard Michaeloff, while pointing out Retrocom’s financial metrics improved almost right across the board in its first quarter report released last week. Considering the turmoil in Canadian retail circles over the past several months, Retrocom hasn’t noticeably suffered. It had no Target stores and only one Future Shop in its portfolio, while it had no exposure to smaller retail chains that have had solvency issues, including Mexx, Boutique Jacob, Jones New York, Bowring & Co., Bombay & Co. and Benix & Co.
“We’ve been pretty well-insulated from a lot of the closures,” said Michaeloff. Retrocom’s five biggest tenants in terms of gross rent are Walmart, Loblaw, Canadian Tire, Sobeys and Metro, which combine to account for 37.9 per cent of gross leasable area and 36 per cent of gross annualized rent. SmartCentres owner Mitchell Goldhar and a group associated with him own about 18 per cent of Retrocom’s outstanding and class-B units, which has created synergies that enable Retrocom and its small staff to leverage off of SmartCentres’ industry relationships to keep costs down, increase rental and occupancy rates, lengthen lease maturities, strengthen its tenant base and develop and execute redevelopment plans for certain properties. While enclosed malls still earn the most rental revenues in Retrocom’s portfolio, the majority of the Vaughan, Ont.,-based REIT’s acquisitions in recent years have been open-air plazas and unenclosed new format shopping centres that include multiple buildings. “From a tenant’s perspective, the costs of occupancy in those open-air centres are more affordable,” said Michaeloff, explaining that tenant preferences and economics have driven the trend away from enclosed malls. Retrocom recently announced a $30-million redevelopment of Regina’s Golden Mile Shopping Centre that includes the construction of a new 92,000-square-foot Real Canadian Superstore leased to Loblaws and the renovation of the rest of the property. GoodLife Fitness will serve as the other anchor tenant with 25,000 square feet, and the majority of the centre will be open-air. Major construction will kick off in September and be done in several phases, with full completion scheduled for the first quarter of 2018. “By that point in time, we’ll have taken a somewhat obsolete enclosed shopping centre that was built a long time ago and lost a lot of appeal to customers and transformed it into a state-of-the-art, cost-efficient, new shopping centre,” said Michaeloff. Retrocom has also secured a new $80-million mortgage loan on Regina’s Southland Mall bearing an interest rate of 3.48 per cent and a 10-year term, replacing a maturing $34-million mortgage with a 5.29 per cent interest rate. Retrocom owns a 30 per cent stake in Creekside Crossing, a 430,000-square-foot, unenclosed shopping centre in Mississauga that’s about 85 per cent complete. Walmart, Costco, LCBO, RBC and TD Canada Trust are among its tenants. The REIT is adding pads at five shopping centres in Ontario, Saskatchewan and Quebec that will increase its overall leasable space by 38,200 square feet at an estimated cost of $7.6 million. 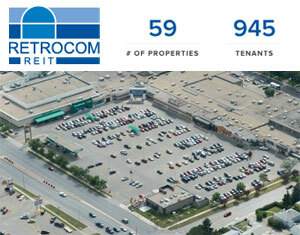 Retrocom is also at varying stages of disposing of three underperforming Ontario properties that no longer fit into its core strategy: Mountainview Mall in Midland; Elgin Mall in St. Thomas; and Kenora Shoppers Mall in Kenora. “These three properties only represent about two per cent of the total value of the portfolio, and yet they represent between 35 and 40 per cent of total vacancies,” said Michaeloff, who hopes to have them all sold by the end of the year. Retrocom’s occupancy rate was 84.8 per cent at the end of March, and the goal is to increase that to above 90 per cent while also aiming to raise its average lease rate from $10.82 per square foot. The REIT purchased nine properties for $179 million last September and is integrating them and focusing on internal growth initiatives as opposed to actively seeking out new shopping centres.